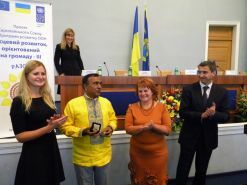 On 24 September 2014 the Third phase of EU/UNDP Project “Community Based Approach” was launched in Cherkasy oblast. 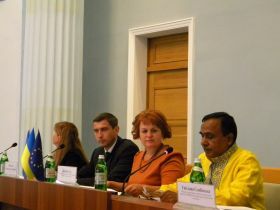 The presentation took place under participation of Head of Cherkasy Oblast State Administration Yuriy Tkachenko, Head of Oblast Council Valentyna Kovalenko, International Project Manager of EU/UNDP Project “Community Based Approach” Jaysingh Sah, Monitoring and Communication Specialist of EU/UNDP Project “Community Based Approach” Svitlana Slabinska, leadership of rayon state administrations and rayon councils; and heads of village and city councils. During the launching of the Third phase of the CBA Project a Partnersh ip Agreement was signed with Cherkasy oblast state administration, Cherkasy oblast council and UNDP. The main goal is the willingness of local communities and local authorities to implement the community based approach in a full-scale. In terms of the agreement 8 rayons will be selected based on the results of a competition for participation in the project for the next 4 years. 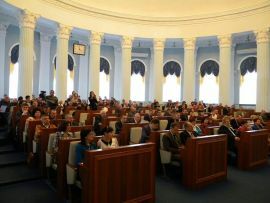 The Application form can be found: http://www.cba.org.ua/three/ua/news/announcements/2616-application-form-for-rayons-for-partnership-with-cba. Participants of the regional seminar discussed the Project role in a social and economic development of the region and encouragement of community initiatives on a local level. “Today we have already some concrete results and the most valuable is experience which we gain in terms of this cooperation. This is valuable not only for our communities, but also for authorities, as under the Project support innovative approaches are being used”, said Yuriy Tkachenko, Head of Oblast State Administration, in his welcoming speech. In its third phase, CBA project will strengthen capacities of regional and local authorities to practice participatory governance, as well as intensify community-based approach in Cherkasy region. CBA activities will focus on rehabilitating basic social and communal infrastructure in the priority areas of energy efficiency, health, environment and water management together with promoting small farm and non-farm businesses in rural areas. 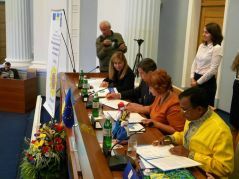 It will support the Ukrainian Government in developing policies in the area of decentralisation and share innovative approaches and good practices on participatory governance and commun ity-led local sustainable development through knowledge hub and the curriculum of twenty regional universities. Implementation of the first phase of CBA Project commenced in Cherkasy region during August 2008. First phase was succeeded by a second phase in July 2011. Over these two phases, 122 085 men, women and children of the region have benefitted from improvement in 51 schools/kindergartens, 37 healthposts, 7 water supply, 25 street-lightning and so on. This happened through joint effort of the citizens, oblast/rayon/local level governments, CBA Project and the private sponsors.